There is probably no other pressure washer in the market that makes power washing easy. The Powerworks 51102 is a simple, effective and efficient pressure washer that turns on with the flip of a switch. Thanks to the long reaching wand and spray tips, you can leave the pressure washer rooted to the spot and clean all around you, changing tips at a moment’s notice, shooting water high up the sidings and walls. The only real problem with the 51102 is that it lacks a bit of power, which becomes evident just as you start pointing the 40 degree nozzle upwards. Considering the price, the Powerworks 51102 is a well powered electric pressure washer. It does not exactly deliver over 2000 PSI but as a commercial pressure washer delivers just enough. The induction motor is designed to last long and encased in durable plastic with soap solution containers to the sides, extension wands designed for efficiency it delivers all the 1700 PSI at 1.4GPM. Together, the overall output is actually better among most commercial washers. With 1.4 GPM and 1700 PSI you can clean your car, furniture, patio, garage floor, driveway and many other things. 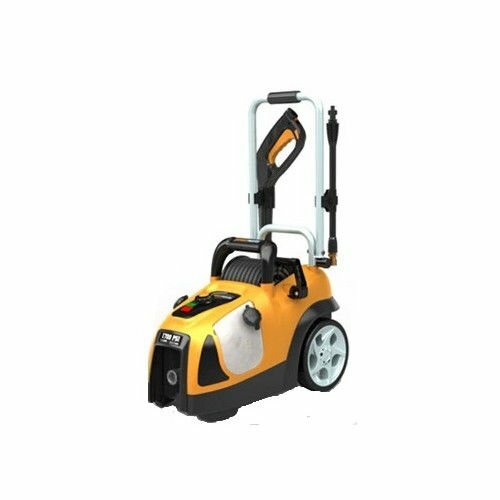 The best thing about this pressure washer is that it can be carted along because of the portable design and onboard accessory storage space. This allows you to clean out your bathrooms and kitchen space too. Moreover, with the ability to store soap water in its tanks, it works great in disinfecting and cleansing or scrubbing floors. On the outside it is primarily plastic but unlike other commercial pressure washers, the plastic used here is sturdy and durable. In fact, nothing vibrates or falls off as you use the pressure washer. The Powerworks 51102 does not compromise with joints and connectors. These are the most vital components in any pressure washer and this particular model uses metallic connectors or joints almost all the time. Most customers were happy to report two years or regular problem free usage. I did notice a bit problematic with the tanks though. Winterizing this pressure washer is both easy and hard. It is easy because there is no oil or gas problem to deal with. However, removing water or soap solution from the built-in tanks is an entirely different proposition. I had to tilt the entire unit over just to get the last drops of water out. Powerworks offers an amazing customer service. In fact, if you wish you can call them up just to find out technical and warranty related information about any of its products. I gave them a call to confirm about the use of metal in connectors and joints, which they were more than happy to clarify for me. If this is how Powerworks treats soon-to-be customers then I don’t see any reason why they won’t mind assisting me afterwards. 35 feet long power cord and Ground Fault Circuit interrupter with Universal motor. 1.4 GPM and 1700 PSI pressure, perfect for light-duty chores. Hose measures 25 feet and is great for cleaning far out of reach places. Dual tanks that can both take soap solutions. Comes with a quick-connect wand and a plastic spray gun. Light, easy to use, portable and noiseless. It can accommodate a long reaching 100 feet extension hose as well as operate with different nozzles and spray tips. Great customer support too. 1700 PSI at 1.4 GPM may not be enough for cleaning the driveway and concrete. However, it works great with cars, patio, furniture and roof or sidings. Adding soap solution is tricky and winterizing is trickier. An average consumer hardly ever requires more than 2000 PSI. At 1.4 GPM, durable design, ergonomic functions and silent operations the Powerworks 51102 is a must have home power tool. Even if you already have a gas power washer, get this as it lets you wash inside the house using soap solution fed at high pressure through various spray tips.